Mark Allen, owner of Mountain Bureau, LLC, and I chose the North Ridge of Mount Baker as a late-season objective and planned our attempt for the last week of September 2017. Allen, who is an IFMGA guide (the highest internationally recognized mountain guiding certification), has graciously acted as my mentor since returning to the mountains after a 15-year layoff. The North Ridge is a classic Fred Beckey route on the 10,781-foot tall volcano that lies in the direct path of multiple jet streams, giving it the distinction of holding the world record for snowfall in a season. The North Pacific Jet Stream dumped three feet of new snow onto the mountain after 100+ days of zero precipitation in the days preceding my arrival. We planned a “carry over” style of climbing which involves taking all the gear over the top of the mountain and down the other side. Although this tactic provides a safety margin of having shelter in the packs, it demands more work due to the heavier loads. This strategy seemed wiser considering the new snow; crevasses could be more hidden, and avalanche slopes additionally loaded, potentially adding travel time. Another consideration was an untimely injury. Preparations at home in Texas were progressing flawlessly until two weeks before departure; I severely rolled an ankle while trail running. I had to back off training, and the trip became jeopardized. After a week of daily conversations, optimism ruled, and we continued with the plans. 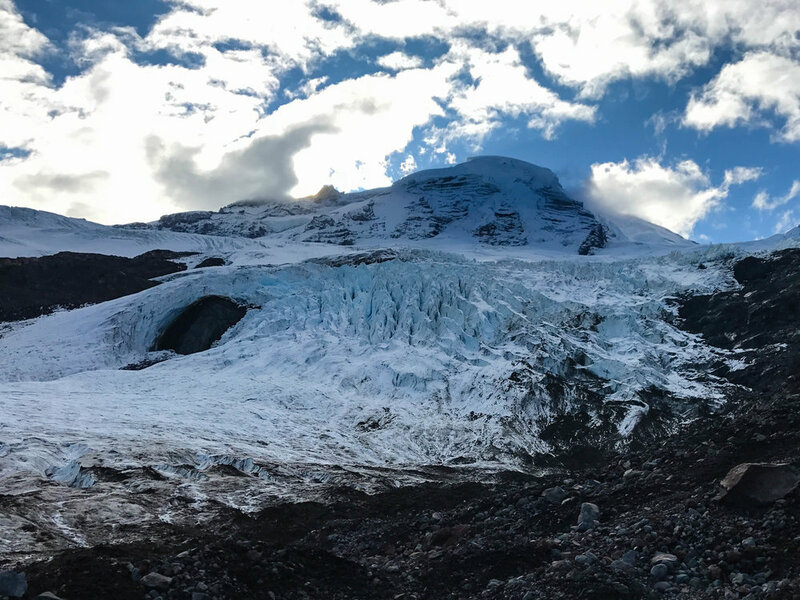 The first day on the route involved gaining 1200 feet of altitude through densely wooded forests to a camp at tree line near the toe of the Coleman Glacier dubbed “Mirkwood” at 4600 feet. We started up in the rain, and the circuitous path through dense forests of pines, firs, and hemlocks held the humidity of recent rains. This two-hour hike was the perfect warm-up for the four days of effort yet to come. After the usual daily rituals of collecting water, setting up camp and eating, a restful night was in order. Mirkwood Camp- Camp 1 was at treeline just under the toe of the Coleman Glacier at 4600 feet. Recent rains soaked everything, requiring trenching around tents to keep them from flooding. The next morning, after a quick breakfast and breaking down camp, we rehearsed ice climbing skills on seracs at the bottom of the Coleman Glacier. Four hours of practice refreshed skills that laid dormant while in Texas and I learned a few new techniques relevant to leading on ice. We progressed up the glacier, and the unplanned difficulties began immediately. The recent storms had destroyed the usual North Ridge approach trail on the Roosevelt Divide. Hiking through the lower moraines in crampons, across rocks and boulders covered in slushy snow proved difficult for my injured ankle. Progress was frustrating and slow, be we pressed through four and a half hours of effort to gain and ascend the Roosevelt Glacier to reach a beautiful camp at the toe of the North Ridge at 7600 feet. We caught the sunset bathing the range in alpenglow. Laying in my bag that night, I was excited to attack the ridge, but nervous about my ankle. There would be a point of no return, and we would have to commit to climbing over the top as retreat would be improbable. Mt. Baker from the Coleman Glacier - Mt. Baker’s height of 10.781 feet often overshadows the vertical gain required; this route gained 7381 feet. The North Ridge follows the left-hand skyline, the ice step visible near the summit. The recent storms scoured the snow off the upper portions of the North Ridge, doubling the length of the ice climbing pitches near the top. Although these sections are technically the most difficult, they were the easiest for me as the ice climbing didn’t affect my ankle as much. Standing on the front points of my crampons allowed my feet to stay horizontal, requiring more work, but reducing the pain. Energized by my ability to make progress relatively pain free, I scurried up the vertical sections quickly, almost giddy. Once the angle eased off, the steep glacier again supply agony with each step. I’ve had issues finding foods I can tolerate at high altitude and exertion. I resorted to pre-prepared energy foods that had been working well during training. Although I was eating well early in the day, by midday my caloric intake had slowed, and the results hit during the spookiest climbing I have experienced. A gigantic jumble of seracs guarded the summit, creating a surreal landscape that will not be forgotten. Climbing through this three-dimensional maze was terrifying; walking across snow bridges no wider than a boot, gaping holes on one side and the mountain falling away on the other. Again, Allen had to deal with my lack of urgency getting both feet secure. He was forced at one point to directly anchor me to a snow bridge so he could cross alone, then belay me from the other side. This serac section obliterated me; all energy dissipated and I was unable to keep myself warm. Eventually, we stood atop Grant Peak, pausing there only briefly. I was shivering uncontrollably with darkness and dropping temperatures looming. For the next few hours, I was a complete wreck, unable to downclimb what earlier would have been a stroll. Allen had to lower me down an icy Roman Wall section on the Deming Glacier via body belays until the angle eased. We set up camp at 9000 feet, at the first safe site on a saddle on Pumice Ridge across from Colfax Peak. The “Ninja Turtle” carryover plan was saving me on this 14.5- hour long day. Allen ushered me into my bag, and went into caretaker mode, forcing two liters of bullion into me, starting the recovery process as snow and darkness began to fall. We decided to delay the start as long as possible to allow my ankle to recuperate. The additional overnight snow left an untracked surface inundated with large crevasses on the Coleman Glacier. Descending the stable snow was casual, but this would be short-lived. As we lost altitude and the temperature increased, the fresh snowpack became unconsolidated, constantly moving underfoot, and my ankle finally gave up. It would just fold when footing broke free; it was extremely disheartening. We decided to cut the day short and finish glacier travel early in the morning, hoping that the overnight low temperatures would solidify the glacier’s surface. We set up camp at the Black Buttes camp at 7200 feet and spent the remaining daylight practicing crevasse rescue techniques. The fifth and final day on the mountain proved relaxing by comparison. Arising early in the morning proved worthy as the snow became somewhat solidified and I was able to descend competently. It was a huge relief to take the crampons and rope off at the Heliotrope Ridge at 6000 feet and walk on rocks and dirt. We descended through the forest, feeling accomplished and triumphant, not because we had conquered the mountain, but because we had persevered and managed my ankle injury as a team. Looking down the Roman Wall of the Deming Glacier, aiming for Pumice Ridge, hidden in the clouds in front of Colfax Peak. I want to express my sincerest thanks to Mark Allen and Mountain Bureau, LLC. I am sure at times he saved me from potentially serious injury or worse, and I learned a lot, not just about climbing techniques and strategies, but about myself. I have to engage a feeling of urgency when the situation demands it and drop my laissez-faire way of thinking; I have a child now, and my family deserves this of me. Most of all, I want to thank Mark for being a friend.